To start, let me make it clear that I am not a writer, I am a painter having to write about painting. Most of my days are spent standing or sitting in front of a canvas painting and other times daydreaming. Once in a while, I travel and do the same thing somewhere else. Born in the surroundings of the high desert, with yellow ochre sandstone houses, red sienna colored mesas, bright blue skies, and brilliant colors in the sunsets. I find inspiration. A constant sight of rolling tumbleweeds and hearing the rattling tails of snakes in the summer is where I call home. It is the inspiration for many movies, books, and especially art… my art. 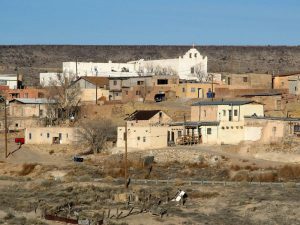 Laguna Pueblo in New Mexico, USA, has been my home for 37 years. Although the development of industries, cities, and trains surround this place, the traditions and ceremonies still thrive in the hearts of the people. This life will continue being taught to the young that will survive us all. As a Native American woman from Laguna Pueblo, I share experiences that life has given to me on to canvas, and I am truly grateful for this. Driven by the paintbrush and canvas, I share my story. I have been given a path to follow that is unusual for a person of this area. 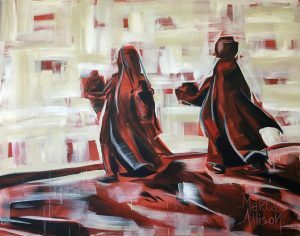 In my early years after graduating art school, I achieved an Associates Degree from IAIA (the Institute of American Indian Arts) in Santa Fe, NM, USA. 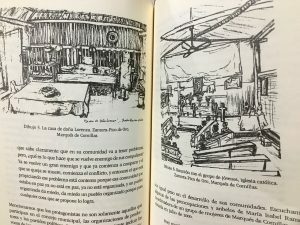 In 2000, I was awarded an internship by the AISES program (The American Indian Science and Engineering Society) to accompany the professor, Neil Harvey, of the New Mexico State University, and spent 6 weeks in Mexico where I sketched drawings for his book. We spent the first and last week in Mexico City where I was first acquainted with a big city, taxis, subways, smog, millions of people that don’t fully speak my language, and a lush jungle that seemed like a never ending green all around. For the middle 4 weeks, we traveled throughout the state of Chiapas, sometimes chaperoned by men with guns, the smells of mouth-watering coffee, navigating along the edge of cliff lined roads with clouds still rising, and the parrots of the brightest reds. There we met and interviewed the village leaders. After my return I was so happy to recover from the hundreds of mosquito bites and upset stomach. It was a great life experience to be sung to sleep by howler monkeys and wake up to the light touch of jungle geckos (I think that now but in reality I cussed at the monkeys and violently shook away the gecko). Near the end I saw the long pour of monsoon rains as I have never thought was possible, since I come from the desert where our rains last about 10-20 minutes maximum. It was such a splendid dream. To return home, I was grateful for what I learned, but in the back of my mind it led me to want for more, and I knew being an artist was a must for this to continue. My career started 8 years later after a construction job with my dad and brothers plus driving for the local elderly center. I was always trying to be an artist of some type and my closet was filling with unseen work. Applying to art shows and getting accepted was the first step. In 2010 I was awarded a Native Women’s Fellowship at S.A.R. (the School for Advanced Research) in Santa Fe, NM, USA for 3 months. 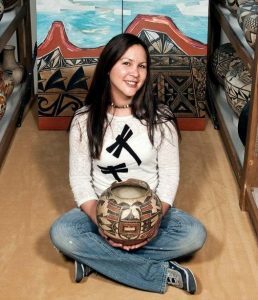 Working uninterrupted while researching one of the largest pottery collections of the United States’ largest collection of the Southwest Native American tribes was truly blissful. This gave me a firm understanding of what past artists of my bloodline made with the resources they had before western influence occurred and after. I’ve been fueled by these designs since childhood but to have such an intense time of seeing so many in one place, it helped me to develop my own designs that I still use with my artwork. The three-month residency experience made me give more detail to my paintings, a cleaner brushstroke, and a precision of separating colors exactly where I want them. This made me a little obsessive but not to the point of compulsive, thankfully, just more aware of how I want to paint. Last year during the month of April, I was awarded an Artist Residency, hosted by Abu Dhabi Art Hub in Abu Dhabi, UAE. Going to a completely different style of desert, in a place I had no idea if they spoke English, was a bit nerve-wracking. I found that living in such a foreign place on the opposite side of the world from my home was an enlightening experience and my hosts spoke great English. The first day was a quick giddy-up and go whirlwind to be shown the city of Dubai and museums while the people of Abu Dhabi’s workweek continued for them. The morning was filled with sounds of a bustling city, industry, metal clanking, and horns sounding with industrial blowers in full amplification of ear throbbing decibels. Friday was their day of rest. To wake up on Friday morning when the whole area had the day of rest together was a strangely peaceful bliss of silence. When I awoke, I heard nothing. Surrounded by millions of people, industry, businesses, and finally… the city was at rest. I saw people pleasantly enjoying their day. At 10 AM, I walked up to the heated rooftop and noticed cars parked in the street, cranes still in place, no clouds in sight, nothing to be heard other than my footsteps and a soft breeze. Suddenly, over the loud speaker broadcasted over all the land was the Adhan (the Muslim call to Prayer) filling the silence with a man’s warm voice of long notes almost like controlled heartbeats in prayer for what seemed like years all given in about 2-5 minutes. This was a sound that will stay with me for a lifetime. With a whole month of this to learn and explore, I was in awe. Finding similar desert life patterns like pottery used for water to be carried over distant lands and body-covering clothing similar to my own people was so familiar yet so completely different. Comparing the desert I know of plants, trees, deer and elk to this almost desolate Emirates land with the occasional camel and spot of oasis was always in thought. The big difference that made me stop and really think was their horizon of this solitary line between sand and sky making me the only thing out of place. The only thing changing two elements of one to the other was my presence and that was overwhelming to experience. Reflecting on the life thread that connects us all to this great earth is what is so amazing. To explore with each new encounter of where I go, and to think that, the ability to paint is the reason I am able to get there, still blows my mind. Now, after a year of recovery and reflection, I prepare for a month in Bristol, UK and await the new fork in the road that this life offers. From the desert of brown I go to green hills of Bristol, surroundings of an urban utopia, the lands of castles, dragons and unicorns. What will be the next influence to my palette this time? I guess I will find out soon enough. Marla will be the artist-in-residence for ‘Beyond the Spectacle’ between 10 May and 6 June 2018. During this time she will work closely with Rainmaker Gallery, and an exhibition of her work will take place there at the end of the residency. 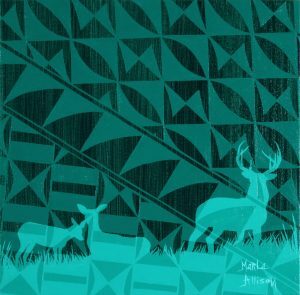 In addition, Marla is the keynote speaker at our symposium, ‘Indigenous Art in Britain’, which is taking place at the University of Bristol on 6 June 2018 – more information is available here. More information about Marla and her art can be found on her website here.